Interesting facts about honey bees could easily fill volumes of books that you can spend hours reading. Quite simply, bees are fascinating. Not only that, but bees are essential for the production of most foods that you grow. Without pollination from honey bees, plants will not produce fruit. No matter if you are growing strawberries, squash or fruit trees, you must have honey bees for a successful garden. There are eight species of honey bees although not all of them are commonly seen. Some were specifically bred for desired traits and their ability to produce honey as well their ability to resist diseases. German Black bee-An aggressive variety, this bee was brought to North America by colonists around 1630 to pollinate their fruit trees. African honey bee-This bee was brought to the United States from Brazil in the hopes of improving the genetics of the European honey bees. Italian honey bee-The most common honey bee in the United States, this bee was introduced in 1859 and is known for being relatively gentle. Carniolan honey bee-In 1883, this bee was introduced from Yugoslavia and Austria. Also a gentle bee, this species is most common in northern areas. Caucasian honey bee-Originating in central Caucasus near the Black Sea, this honey bee was introduced from Russia in 1905 and is known to be gentle and calm. Buckfast Hybrid-This honey bee was developed in the United Kingdom by Brother Adam of the Buckfast Abbey. His goal was to produce a bee that was mite resistant, gentle and productive. Starline Hybrid-This hybrid bee was developed by combining several lines of Italian bees and are known to be calm and to produce large broods. Italian Cordovan-A color mutation of honey bee that is known not only for being gentle, but also for being pretty. When bred with Italians they produce red bees and purple when bred with Carniolan and Caucasian honey bees. Normally, the queen bee lays all of the eggs in a hive, which are then incubated in the hive nursery. Total incubation time depends on the type of bee that is being produced and can range from 16 to 24 days. The outcome of each egg depends on two factors-fertilization and food. 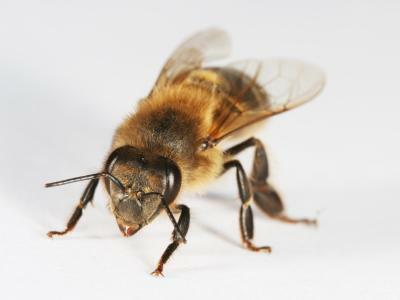 Fertilized eggs become female bees. They are fed a diet of brood food that progresses to a diet of pollen and honey. These sterile females become worker bees. Other female bees may be fed only royal jelly which results in the development of queen bees. Unfertilized eggs become males or drones. The only purpose of the drone bee is to mate with a queen bee. After mating the drone dies. Bees can fly six to nine miles per hour loaded with pollen, and eight miles per hour when empty. A honey bee's average flight radius from the hive is two miles, or 8000 acres. Its total flight during its lifetime is 500 miles in five to 30 days. Honey bees can make up to 29 trips from and to the hive each day and can carry up to one half milliliter per load which is about one drop from an eyedropper. The mileage required to make 150 pounds of honey is equal to 13 round-trips to the moon. A full load of pollen requires 50 to 350 flowers or eight to 100 visits. Queen bees are fed every 20 to 30 minutes during the peak of brood rearing.